KUALA LUMPUR (Aug 1): Although the deterioration of manufacturing conditions in Malaysia slowed to the weakest pace since March at the start of the third quarter of 2016, volumes of unfinished work accumulated for the first time in six months with a rate of increase that was the sharpest since last November, a report by Nikkei Inc and IHS Markit said today. 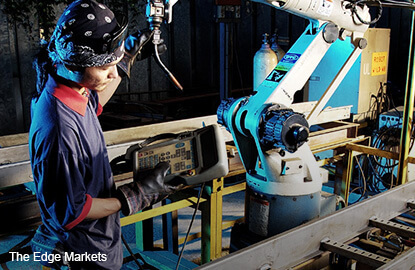 The Nikkei Malaysia Manufacturing Purchasing Managers' Index (PMI) report stated that according to data, due to a recent fall in employment, extra pressure was placed on manufacturing capacities and for the first time since April, manufacturers cut back on staffing numbers in July. Although the reduction in staff in July was marginal, it suggests that companies are less optimistic towards the outlook of the manufacturing industry, Markit economist Amy Brownbill said. "Operating conditions in Malaysia worsened at a slower rate at the start of the third quarter of 2016, helped by slower contractions in both production and new orders," she said. "However, manufacturers cut back on their workforce numbers for the first time since April, suggesting companies are less optimistic towards the outlook," she added. Brownbill said buying activity was scaled back at historically marked pace but cost inflationary pressures eased for the first time in four months, helping goods producers to improve their profit margins. "As a result, manufacturers increased their charges at a weaker rate," she added. The headline Nikkei Malaysia Manufacturing PMI is a composite single-figure indicator of manufacturing performance and is derived from indicators for new orders, output, employment, suppliers' delivery times and stocks of purchases. Any figure greater than 50 indicates overall improvement in sector operating conditions. The report stated that the headline PMI rose to 48.1 in July from 47.1 in June, thereby signalling a weaker rate of deterioration in operating conditions in Malaysia. Moreover, the latest reading was the highest since March, reflecting softer declines in output, new orders and stocks of purchases. Production contracted at the softest rate in six months, helped by a slower fall in new orders. Contributing to the overall decline in manufacturing conditions was a contraction in output. However, the rate of decrease eased to the weakest since January. Similarly, total new orders declined at the softest rate since March and one that was slower than the average over the current 17-month sequence of contraction. This was partially helped by a weaker decrease in international demand, as new export orders declined at a slower rate than June's 43-month record, the report stated.